Professor A. R. Mohanty is currently a professor in the department of mechanical engineering at the Indian Institute of Technology Kharagpur, where he has been a faculty since 1996. His specialisation and research interests are in the areas of noise & vibration, condition monitoring, machine design, vehicle dynamics, underwater acoustics and instrumentation. At IIT Kharagpur he teaches Machinery Fault Diagnosis & Signal Processing, Noise and Vibration Control, Machine Design and Automobile Engineering. At IIT Kharagpur he has established a state-of-the-art research laboratory for Acoustics and Condition Monitoring. At IIT Kharagpur he is also a faculty adviser to the Formula SAE student’s car project. Dr. Mohanty obtained his B.Sc Engg (Hons) in Mechanical Engineering from the REC, Rourkela, (Now National Institute of Technology, Rourkela) in 1986. He holds an M. Tech Degree in Machine Design specialization from IIT Kharagpur. His Ph.D in the areas of noise control is from the University of Kentucky, USA and was a post-doctoral fellow at the Ray W. Herrick Labs of Purdue University, USA, in the areas of noise control. He has worked at Larsen & Toubro Limited, Mumbai and Ford Motor Company, Detroit, USA in their respective R&D divisions in the areas of noise and vibration. Prof. Mohanty has been awarded the Chancellor’s Award for Outstanding Teaching by the University of Kentucky, USA and the Rais Ahmed Memorial Award of the Acoustical Society of India. He has been awarded the overseas research fellowship of the National University of Singapore. He is a member of the national committee on noise pollution control of the Central Pollution Control Board of the Government of India. He was the IIT-JEE chairman of IIT Kharagpur for the year 2012. He is on the advisory and technical boards of many private and government organisations. Prof. Mohanty has been a consultant to more than 100 companies in India in the areas of noise & vibration and machinery condition monitoring. Some such companies are Philips, Tata Steel, Larsen & Toubro Limited, Mahindra & Mahindra, Tata Motors, Tata Cummins, Escorts, Eicher Motors, John Deere, Whirlpool, Emami Paper Mills, Dhamra Port, Blue Star, SAIL Rourkela Steel Plant etc. He has more than 70 journal, one book chapter, one patent and over 100 conference publications to his credit in the areas of noise and vibration, condition monitoring and signal processing. He has widely traveled around the world and has done collaborative research in the areas of noise control and condition monitoring with research groups from the University of Kentucky, USA, National University of Singapore, Lulea University, Sweden, Warwick Manufacturing Group, UK and the University of Lille 1, France. 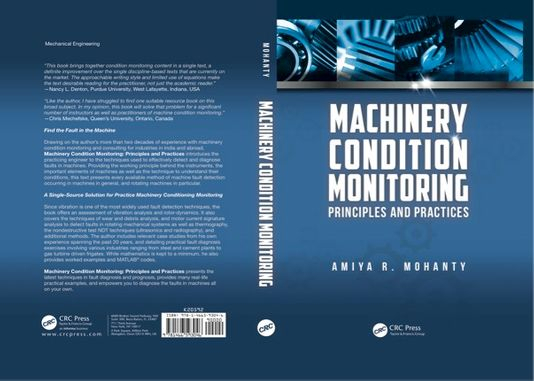 Some of the path breaking researches of Prof. Mohanty are in the areas of Motor Current Signature Analysis for machinery condition monitoring and use of naturally occurring bio-degradable materials for industrial noise control. Prof. Mohanty has several of his research projects sponsored by the Ministry of Human Resources Development, Ministry of Earth Sciences, Ministry of Information Technology, Defence Research Development Organisation of the Govt. of India, and many public & private sector industries in the areas of noise and vibration and machinery condition monitoring. Prof. Mohanty regularly conducts short courses in the areas of noise control, CAE techniques and machinery condition monitoring, for professionals from the industry and academia.